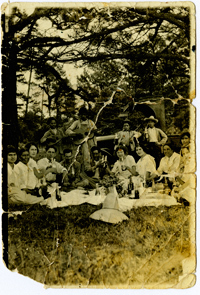 In 1972, my mother showed me an old photo taken of her family at a picnic in Chihuahua, Mexico, She sat and told me the story of the celebration of her brother’s birthday in 1925. It was on the feast of St. John the Baptist (June 24, 1925). People celebrate this feast by having a picnic by the river, as the waters are specially blessed on the day. My mom was 16 years old. It was her brother, Juan Velasquez’s eighteenth birthday, and his Saint’s day. Their mom and their neighbors made food. They cooked chicken, and brought rice, tortillas, pinto beans, and cheese for the picnic. The group drove on a flatbed truck to a pine forest, located by a river, about 7,000 feet up in the Sierra Madres of Chihuahua, Mexico, not far from the small village where they lived. Two young fellows, neighbors, played mandolin and guitar. They made music while all the people danced. In the mountains, it is clear in the mornings. But, every day in the summer, by 3:00pm in the afternoon, there are thunderstorms and torrential rains for one hour, before it clears up again. When the rains came, they all jumped on the truck to quickly get home. The flatbed truck was used in the lumber hauling business, moving railroad ties from the woods to the railways, and was open to the air. Everyone got wet from the warm rains. But, they had enjoyed themselves so much that they weren't bothered by getting drenched, and they quickly dried off. They all had a very good time. The Christero War (1926-1929), would soon begin in Mexico. After many years of the Revolution, including the death of my grandfather by firing squad in 1914, the building unrest and the persecution of the Catholic Church convinced my mother’s family to leave Mexico. In 1927, they would enter the United States in El Paso, Texas. My Uncle Juan had already left for the U.S., to work with his brother-in-law who was a foreman for a mining company in Ludlow, CA. My grandmother, aunt, and mom also traveled to Ludlow to visit with their family, and in 1928, they moved to Los Angeles. My aunt and mom took jobs working in the garment industry. The small 3½” x 5” photo was in poor shape, very damaged and worn. I decided to recreate the photo in a crayon scrafitto painting in 1973. I started with a drawing. Over the drawing, I painted transparent dyes and watercolors. Over that, I applied many layers of crayon and oil pastels, building the surface for the painting. I used the technique of scrafitto, carefully drawing/scratching with a pointed instrument through layers of wax crayon. I drew many patterns and textures for the trees and grasses, as well as on the clothing. For me, it was an elaborate artwork at the time. 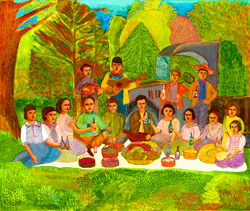 The painting captures a universal quality of family gatherings, of memories of our families and our roots. 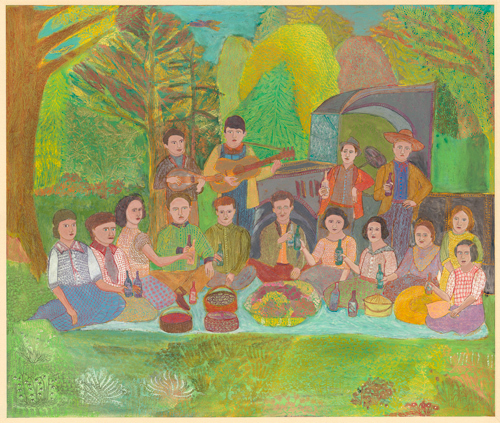 The human experience of our connections to the past—laughter, stories, kindness, sharing, and eating as we gather together, is expressed in this artwork. The other universal aspect is the sharing of food. This includes all the preparations, journeys; and sharing for the meals. Food brought us together – as it has for the story of humanity. I was unsure about sharing this work with people. It is so personal and particular to my family, that I didn’t know if it would be relevant for my friends and collectors. But the more I worked on the image, the more I saw it reflecting our shared connection to humanity. It is not just one family, but a meditation on memories of family gatherings and celebrations, even in times of difficulty. A young man, enthusiastic for my work, saw the artwork and wanted to purchase it. He said it reminded him of his family, and the stories he remembered of their gatherings. They were Armenian immigrants and had lived in the Central Valley of California. His father, the talented and popular singer/composer, Ross Bagdasarian Sr., died in 1972, the year before I completed the painting. 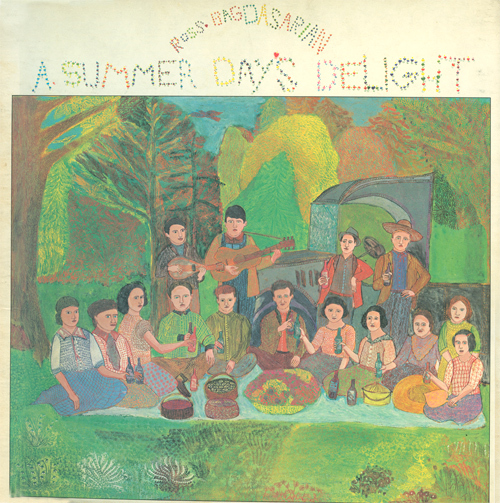 Ross Bagdasarian, Jr. purchased the painting, which was used as the cover art for a special tribute album their recording company produced, commemorating his father. The only visual record I had of this painting was a slide. In 2013, this slide was digitally scanned. I developed the image for use in a poster on community and food which I printed in February, 2014. While I was working with the image, I realized that the scan was too crude for use in a larger, giclée project. I contacted the collector of this painting in 2014, and he agreed to lend it back to me, to be professionally scanned. Together, with my studio staff, we began to enhance the scanned digital image. After a few months, we then took the adapted image file to Kolibri Art Studio in Torrance, CA, and printed a 21” x 24” proof. After seeing the physical proof, we worked many hours correcting and further refining the image. I redeveloped the artwork, painting and exploring ideas for refinements. Then, I printed additional proofs, and inspected them closely after each printing, adding details and making further refinements. On November 19, 2014, I approved the print, and I assigned it as a small edition of 100 giclée art prints.